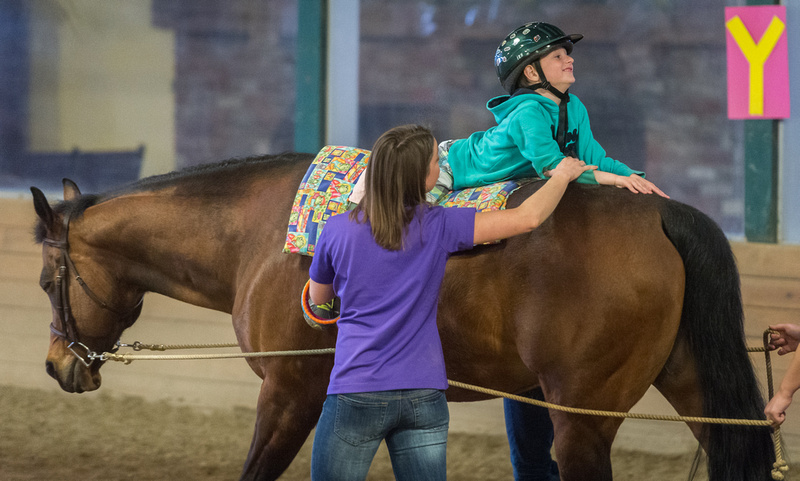 In simpler terms: through hippotherapy, specially-trained physical therapists, occupational therapists, and speech/language pathologists apply the movement, rhythm, and repetition of the horse as a treatment strategy to help patients achieve therapeutic goals. It’s all about movement. The horse’s pelvis shares the same three-dimensional planes as the human pelvis: front to back (anterior/posterior or flexion/extension), side to side (lateral), and rotation. This movement is multi-dimensional and provides systems-wide neurophysiological impact. Receiving the movement transmitted by the horse’s pelvis – which results in weight shifts, balance reactions, and core/pelvis motions – helps the kiddos develop the skills – like motor planning, bilateral coordination, muscle strength, balance, visual perceptual, sensory regulation, weight-bearing, timing, and more – so essential for daily life. In short: The dynamic movement of the horse combined with the dynamic environment leads to functional change. 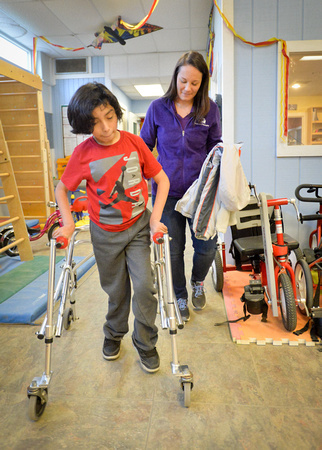 By applying different combinations of patterns (like circles, serpentines, spirals), gaits and speeds (slow walk, fast walk, trot), and riding postures (sitting facing forward, sitting sideways, on hands and knees, lying face-down, standing), our highly-trained therapists are able to provide precisely the sensory and neurological input each child will benefit from most. 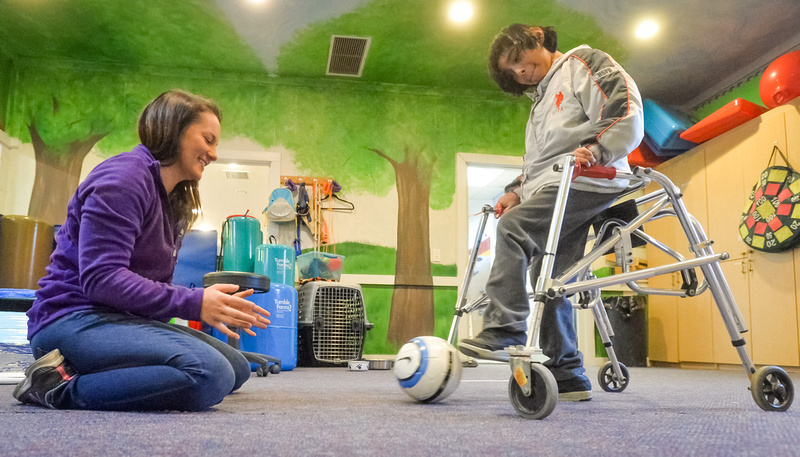 Here's an example -- it answers a question you may have when you see the photo below: Why is that child riding on his hands and knees and backwards during his occupational therapy treatment? Here’s what Miss Leah (on the far side of therapy horse Moe) tells us. In this quadruped position, Ian is facing posteriorly so that his hands are directly over the horse’s pelvis. The three-dimensional motion of the horse’s pelvis is being transmitted to Ian’s shoulder girdle, causing him to isometrically contract the muscles controlling his shoulder girdle and arms. This produces both strengthening and stabilizing effects in his back, core, shoulder girdle, arms, and wrists as he maintains his balance on the horse. How does this help Ian? By developing a strong shoulder girdle and core, the foundation upon which all fine motor skills are built. Vestibular and proprioceptive sensory input and motor planning are the icing on the hippotherapy cake. Are there contraindications for hippotherapy? 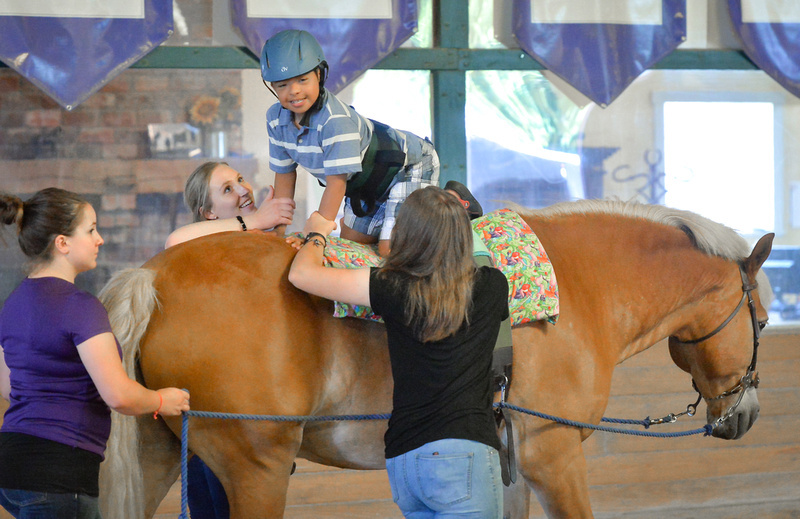 therapies at Children’s TherAplay] to where he is today it reinforces the power and the magic of hippotherapy, that he was receiving OT and PT services elsewhere and that when he came here he made such gains so quickly. It’s incredible.